Sidetrack's Cheeseburger Chili won first prize in the Depot Town Chili Challenge. 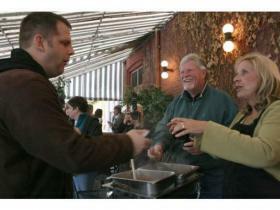 Owner Linda French hands some chili to Councilmember Brian Robb, D-Ward 3. Initial estimates show the fundraiser garnered more than $1,000 for SOS Community Services. Feb. 17, 2010 · 2:37 p.m. The Depot Town Chili Challenge will return for its fourth year Sunday to help raise money for needy families in the county. Cafe Luwak, Queen of Hearts Bakery, Sidetrack, Aubrees, Ypsilanti Food Co-op, Ugly Mug and the Corner Brewery will be serving two types of chili each, according to Chelsea Clark, SOS Community Relations Coordinator. “This event is a true testament to the local business owner’s generosity,” Clark said. Clark said for $5 the participants get a map, pencil, voting cards and a tasting card. The event runs until 6 p.m., when the votes will then be tallied and a winning chili from one the entrants will be crowned. Last year the event raised more than $1,000 for the charity. This was $300 more than the previous year’s amount. Clark said even a tough economic climate, Ypsilanti residents have remained generous. Last year, Sidetrack’s cheeseburger chili was declared the winner. Clark said she and other representatives from SOS will be on hand to see who claims the top honor this year.